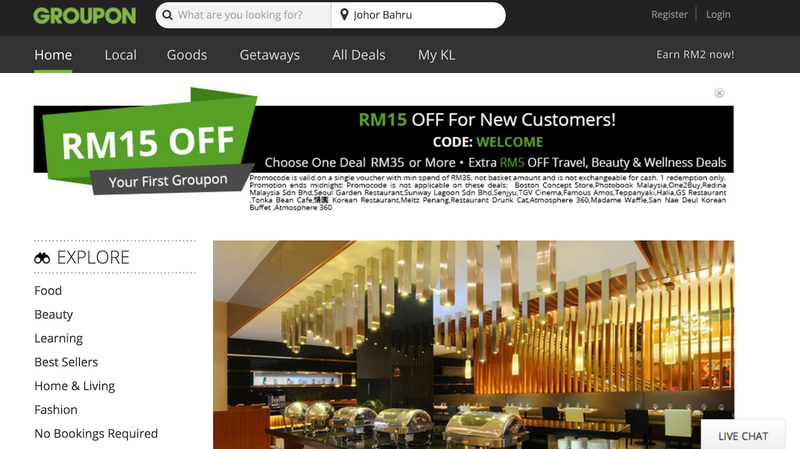 Carinn; carerynn | Malaysia Fashion, Beauty & Lifestyle Blog: Shopping: Time to Save Money with Groupon Coupons! Shopping: Time to Save Money with Groupon Coupons! Let's be honest here. Who doesn't like to have that extra buck or two in your wallet? What if I told you that it's possible to fulfil your shopping needs, but still save money at the same time? Some of you may or may not know, but I am currently freelancing so every cent counts when it comes to saving money. Believe it or not, this is actually a trick that I learnt from my mother, an avid Groupon user! She uses this coupons-saving site all the time to buy dining vouchers or merchandises, and I've picked up on this skill to help me save some money while enjoying life! Most of you would be familiar with Groupon, a group-buying site that connects local businesses or e-commerce to customers while increasing consumer buying power at the same time to drive more business to local merchants. For me, Groupon is more than about money-saving. Some of the deals are quite interesting and they vary from food to fashion to beauty to services. This allows you to try out more things at a fraction of the price. It's a good way to gauge the service or product when you're trying it for the first time. You don't have much to lose anyway as you paid a promotional price to experience something new. The best part? Groupon Coupons can be found almost anywhere in the world! Sephora - Up to 50% OFF! Aliexpress - Today's Super Deals at 20% Off! Disclaimer: This post in published in partnership with Groupon Coupons.